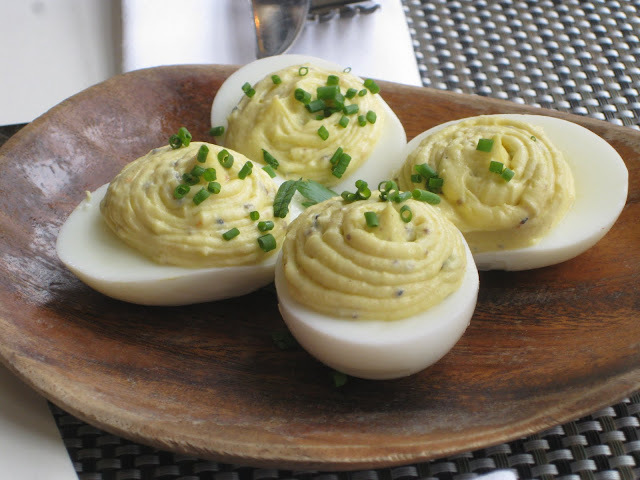 Peel hard cooked eggs, slice in half length-wise and scoop out yolks into a small bowl. Mash yolks with a fork until smooth. Stir in the mayonnaise, yogurt, salt, and black pepper. Scoop a teaspoon of the creamy yolk mixture into each egg white half and arrange on a plate. Garnish with a sprinkle of chopped chives or smoked paprika. Cover with plastic wrap and chill. Makes 6 servings, 2 pieces each. This entry was posted in Bariatric Recipes, Eggs & Cheese, Genius Snacks for Super Bowl and tagged Eggs & Cheese. Tiramisu, tastes like a fine restaurant dessert, but No Added Sugar!